L’Aquila, Abruzzo, Italy. A goverment’s office disrupted by the 2009 earthquake. Image and caption courtesy The Wiz83 via Wikimedia Commons. A while ago at work, we got on the subject of earthquakes. I don’t remember how it happened, but suddenly, I was surrounded by a gaggle of people whilst I pulled up a diagram of the local subduction zone and delivered a mini-lecture on how it works. You’d think such pontification would drive people away. It didn’t. They were riveted. Cascadia Seismogenic Zone. When it finally comes undone, the Pacific Northwest will experience catastrophe on a scale that will make Mount St. Helens look like a sneeze. Image courtesy R.D. Hyndman, Geological Survey of Canada. Granted, it’s a fascinating subject. But there’s a huge amount of misinformation floating about in the aether. I had to do some gentle correction – and a bit of putting the fear of Cascadia into folks. It reminded me how critical it is to be aware of what’s going to hapen here – and how few people realize it. One of my coworkers had vaguely heard that there was a dangerous fault that could lead to a big earthquake near Oregon. He didn’t realize Washington was also at risk – and we’re not ready for something so huge. Everyone I was speaking to looked extremely surprised when I told them we will get hit with a subduction zone earthquake on the order of the Tōhoku Earthquake that devastated Japan in March 2011 – and that we are far more vulnerable than Japan was, because we haven’t done what they have to prepare. A close-up view of the ripped and twisted metal on a Japanese dock that washed ashore at Agate Beach, OR. The March 11, 2011 earthquake and tsunami ripped this 47 ton concrete and metal structure from its moorings and sent it to sea. It floated across the Pacific to land in Oregon over a year later. Author’s photo. That’s when the fear started. It’s a healthy fear, a realistic one I wish more citizens shared. We don’t need paralyzing fear, but the galvanizing kind, the kind that forces us to get informed and do what it takes to prepare for the inevitable. We discussed some of the risk we’d face here in our particular corner of the Seattle area. We’re far enough inland and high enough in elevation that we won’t have to worry about being washed away by a tsunami. But some folks were under the impression we’d be safe from earthquake damage here. That’s not true. We won’t suffer the worst of it, unlike the coast, but a look at the shake map shows we’re going to get a shaking strong enough to cause damage; we’ll experience several minutes of severe shaking, and those earthquake waves have a terrible potential to get trapped and amplified by the basin we’re in, making that shaking worse. We are going to get hit: that’s a certainty (pdf). It could be today, tomorrow, months or years, but the Cascadia subduction zone will eventually slip catastrophically. And many of the residents don’t even know it’s there. Most of our emergency services aren’t prepared for an event of that magnitude (pdf). They don’t realize that “The Big One” isn’t going to be a single event, but a series of severe shocks that could go on for years after the 9.0. Ignorance of geology will lead to a greater catastrophe, because we didn’t know enough to prepare our cities against seismic threats. Looking toward shore on Agate Beach, it becomes obvious we haven’t prepared for the 9. Note the shiny new hotel nestled right in the low point of the tsunami hazard zone. This is why we need to talk geology: so that people don’t risk their lives and fortunes by building in the path of inevitable destruction. Author photo. 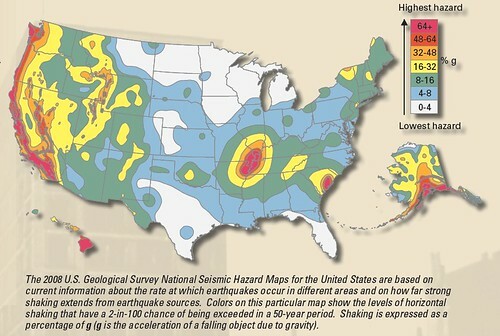 USGS National Seismogenic Hazard Map. Image courtesy USGS. If you’re doing the educating, it’s no wonder they’re riveted. Geology textbooks by Dana, please! Get out! Get out while you can! I remember learning that the Green River Valley, all that lovely farm country from Enumclaw through Auburn and Kent and Renton (getting progressively less farmy) had been periodically scoured by lahars pouring out of Mt Rainier. And I wondered why the heck we were living there. *looks at the map* California and Nevada make sense, and so do Alaska and Hawaii. But what’s up with South Carolina and the Mississippi/Ohio River confluence? Preachin’ to the choir, in my case. Well said, and keep up the good work. To answer Robert, the Mississippi valley is due to the 1811 1812 earthquake sequence, when for a while the Mississippi river ran backwards. This formed Reelfoot lake. See :http://en.wikipedia.org/wiki/Reelfoot_Rift for details. The events were between 7.2 and 8.2 in size. The cluster in Northern New York extends and is centered in Canada where events have occured. In Western Tn they have anchored the bridges over freeways with cables to prevent them from flying off their supports during an earthquake. I don’t agree with you about the value of knowing & understanding geology but risk is everywhere and most people just figure it won’t happen to them. Yeah, some politician was wanting to close the USGS, talking like it was only doing mining surveys for geezers with picks and pack mules, while I was getting elevation models and hazard maps from it. Plus, geology classes have the best field trips. I remember reading some article about the mega-quake due for Seattle – it said something about how the plate appears to be under pressure and is flexing upward several inches a year (or something like that) and when it lets go the whole thing will drop a foot or so and great fuckage will ensue. It was a really badass article that explained everything very well. I am very happy atop my mountaintop in the adirondacks. I just had a moment of flustration thinking, “I wonder if Dana wrote the article I’m talking about, and I’m a complete idiot…” But, no..
Perhaps Dana should go and give talks in Orting, WA. Where they continue to build houses on the lahar plain, much closer Mount Tacoma (aka Rainier, named after some Englishman who never saw it) than the green river valley. I, on the other hand, have a place outside Port Townsend, WA, overlooking Discovery Bay. With a fault line running right up the bay. At least I’m a couple of hundred feet up and might end up with waterfront property when either The Big One or AGW runs its course. We’ll need a new house, of course, since the current one there is a mobile home sitting on blocks and not even tied down. @lyle: So it’s just a historical coincidence, that’s where the improbable quakes happened to occur? Or is there something in the geology of those places I don’t know about that makes them earthquake-prone? Yes there is something about the geology of the places, The Mississippi river is a old (precambrian rift zone) left over from the break up of Rodinia 750 million years go Wikipedia link:http://en.wikipedia.org/wiki/New_Madrid_Seismic_Zone. It was the third arm that did not succeed in breaking the contintent up but represents a zone of weakness in the crust. The exact mechanism to use the geological term ” is not well understood”. But one set of thoughts is that as north America moves west strains accumulate here. Here is a link to a usgs article on the New Madrid seismic zone (another name for the area, as the Earthquakes were strongly felt near New Madrid, Mo. http://geology.com/usgs/new-madrid-seismic-zone. Note that the 1811/1812 earthquakes are supposed to have rung churchbells in Boston. (The east is much harder crust than the west, due to the age of the crust so earthquakes are felt over a larger area). Look up New Madrid seismic zone for more details. The Charleston Sc area relates to left over weakness in rocks after the breakup of the Atlantic ocean. Oops make that for Charleston the break up between North America and Africa.